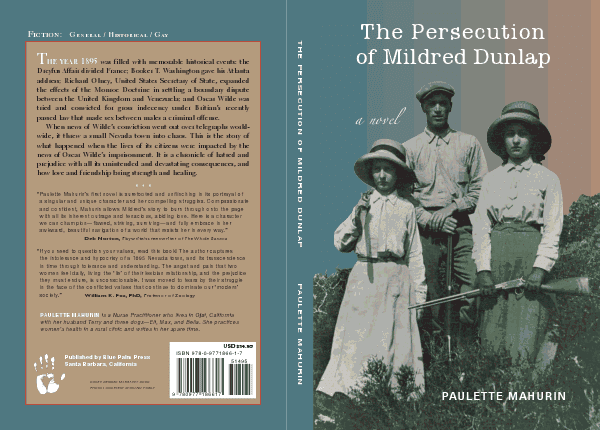 About the author: The Persecution of Mildred Dunlap is written by author Paulette Mahurin, who is a Nurse Practitioner and lives in Ojai, California. She practices women's health in a rural clinic and writes in her spare time. The book was published in March 2012. Summary: The story takes place in a small town in Nevada, right after Oscar Wilde was tried and convicted and homosexuality was declared to be a crime. Mildred and Edra are two women who love each other and want to live together. To prevent the townspeople from dragging them to a similarly horrible fate, they devise a plan to keep their relationship a secret. When Mildred, who has always been treated badly by the townsfolk, suddenly begins to show interest in Charley, a widower, they become the latest piece of hateful gossip and rumours. The book goes on to show us the disastrous consequences of prejudice and illogical hatred. "He was frustrated by the ignorance he saw all around him, the lack of compassion and understanding, even worse the complete poverty of any comprehension that a poison lived inside these individuals and as long as they kept pointing fingers and saw their hatred outside of themselves, nothing would come but destruction." My thoughts: As soon as I got the book, I sat glued to my computer and finished reading it by the time it was absolutely necessary for me to go eat something. It's been a long time since I read a book in one sitting. This is a very involving story that just draws you in completely and keeps you on the edge of your seat, eager to find out what happens next. It is a short but powerful read that manages to convey a lot of meaning in so few pages. The characterization is brilliant. There were times when I felt like kicking some of the nosy characters myself and realized how effectively the writer had brought that feeling out in me. I love how the author has conveyed the most important messages, that sense of helplessness in the victims through dialogue between the characters instead of describing it. Being a huge Oscar Wilde fan, I found the discussions about his conviction especially touching and the way people were against him, especially irritating. Not to mention, the quotes by Wilde at the start of every chapter were wonderful. Though the book is set in 1895, it is painfully relevant even today. This story ends on a relatively happy note, but it is crushing to think that most cases of oppression don't end all that well. The story presents all the different clashing points of view (in a biased fashion, maybe), but the point, for me, was not to show what is right and wrong. What the book suggests is to think before forming opinions, to honestly question your beliefs. I would have liked it better if the back-stories of the characters were revealed in a less abrupt way and the author hadn't kept switching the narration back and forth in time - these things were noticeable while reading the first half of the book, but once I got to the very end, they didn't really matter much. Some books just deserve to be read by everyone, and this is one of those! You can buy the book here, and also visit the Facebook page for more information. I'll leave you with another wonderful idea to chew on, since the book has so many of those. How I was raised is irrelevant. It’s how I feel now. What do I believe now? What has experience taught me? Have I used my head to look for myself? Or am I a puppet to someone else’s ideas? I'm a Wilde fan, too, I can't wait to read this! Thanks for posting!